Edition Details: 1st Ltd. Edn. Hardback. SIGNED, NUMBERED, LIMITED EDN (to 50). The starting point for many scholars studying the art and science of crime investigation, wrongly begins with the creation of Robert Peel's New Police in 1829, yet basic policing and investigative elements had been tried and tested at least 80 years before that. In mid-Georgian times, the playwright and magistrate, Henry Fielding, realised the ineffectiveness of the Parish Police Parochial Watch system that press-ganged traders and merchants into doing their civil duty as Constables. Each Parish Watch operated independently within its own boundary, but since crime fails to respect boundaries many perpetrators escaped. Crimes committed often went unreported for want of a real central police organisation. An innovative plan was needed, and through Fielding's determination the Bow Street Public Office became the "Centre Office" for victims reporting their crimes in and around London. This was the first police station and court building; a hub for crime administration, accommodation for police officers, a place to detain prisoners. Fielding established the Criminal Records system of searchable registers at the Centre Office. Gathering intelligence on crime and criminals not only provided for the first time an understanding of criminality, but also allowed offenders to be caught after the crime had been committed. 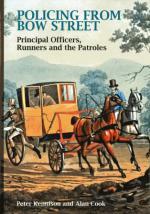 Fielding also formed the Foot Patroles, an organised and regulated body of men, to combat riots, gangs and street disorder, thus establishing an early police sub-culture. This detailed narrative seeks to go behind the scenes of Bow Street to a secret world denied to the majority. The professional and private lives of the Justices and Officers - often called the 'Runners' - are examined here for the first time, revealing their secrets, their experiences and their brave exploits which established them as honest thief-takers, constables and the first early detectives. Illus. in colour and b/w, Timeline, Abbreviations, Bibliog. and Index. 427pp. lge. 8vo. h/back. A fairly heavy book which will require additional postage if shipped overseas. Numbered Limited Edn. SIGNED BY BOTH AUTHORS. New in dw.